The generator will be updated for June 12th's updates. This is a generator that will allow you to put a band's music player from their profile on your page, such as the one shown below. Just submit the link to their profile on Myspace, and if a player is found on that page, it will generate the code you can use to put it on your own myspace. It's not working any more. Can you fix it? Seems that MySpace has changed their coding used for the Music Players. All my custom sites no longer work now because of this. Is anyone working on a fix? Is ANyone Tryin To Fix This? What urls are you trying that aren't working anymore? Paste specific examples. I tried applying the html again from your site but it still doesn't seem to work. Joel and Binx, I just rewrote a certain part of it to work with your type of page. Let me know if it works for you guys now. Thank you so much Gary, you're new code seems to be working! Nevermind, but is there an 'Auto Play' option? It won't embed in comments either. Is there any way to edit the code for auto play and enable embed? I would love to put auto play in, but I cannot figure out how on the new player. If anyone can link me to a player that is already autoplaying, that would be great. Unfortunately if this code does not post in comments, that means myspace is starting to filter it out for some reason or another. Gary can you send me the code for my player as well? All my players stoped working to... Can someone give me the fix?? If it is not working for you, please submit your url again and generate new code. If that does not work, let me know. hey gary,my code is not working out,can you fix this?? Try generating again, it worked for me. This single handedly saved our day, our myspace players started breaking on some of the websites we manage and we were able to re-extract working embeds using this tool. Hi, works great for firefox, but only a black box shows in ie.... any ideas? Thank you this one works well ! a great help!! Thanks so much! I updated it two days ago. I just tried your URL and it worked for me in firefox and IE, please try again or let me know what browser it is. Gabe, I just added support for your page. try now. It generates the code on your site. But when I try and cut and paste to my Paganspace.net site it does not show the player. Is there a way you can check out myspace.com/xdarkxpriestx90 & find a way to generate the code for that, so i can post the profile player into my blog? if you cant, at least show me the part in the source code or send me the source code from view source to put the player up on sites. I can't tell where it is when i view the source code. I can't tell where it begins and ends. Strange. I submit my site and it works on your web, I copy the code to mine, and then i doesn't work... I'm trying it from my harddisc, has the web to be online? AHA! Uploaded the page and now it works! Good :) Ty! I make this website using iWeb. It worked properly until last week. Can you fix this bug? Would be appreciated greatly!! Regards, have a great day! it isn't working for me. posts on page, but not in my set widths and heights. i don't THINK it's a coding issue that i accidentally messed up when re-pasting, i've been staring at it for awhile. i left it messed up for now, still plays music, so you can see what it does. thanks! I copied the code onto the web page and got - a box. It's the same size as the player but that's it. Any suggestions? update on last entry. I was viewing the page from edit mode before. Now when viewing the page, the player is there but when I try to play a song, I get the message that you have to be logged in to play it. I am logged in and the visitors to the site will not be. Suggestions? I generated the code and tried to use ist on my webpage, but it does not work att all. Hi, Thanks so much for the code! works brilliant. I'm trying to work on the color of the player though. I've set it to dark in myspace but the light player still embeds (is the same on the popout player - light). Maybe something needs to update somewhere or maybe embedded versions default to light color only. any ideas? Also, I've embedded a google calendar and redirected it to use my own CSS file and JS file - is anything like that possible here or am I showing my ignorance? Yeah i search this 30minute... thank you!!!! thanks this fixes the problem, new player working great. If they block it I'm not sure there's much you can do to get around that. Well done Gary thank you much!!! Thought I would leave a second message to show my deep appreciation and love of keywords. This 2011 myspace band music html code generator for embedding your profile player without the interrupting ads into a blog, wysiwyg, forum, article, post, social network, html editor, and etc. Is exactly what I was looking for. Thanks v much for this. Can I ask a favour? Would it be possible to turn off the autoplay? Can you please provide a code for me to embed the new music player on my personal website (not myspace)? I have had the old player on my site working without any problems, but now it is just a blank box. Dear Paolo, I have already tried the code using the generator, and it doesn't work. All I get is a blank box. If you go there, you can see the blank box. Click on it and view the source code, it is exactly as your generator provided. The box eventually says there is a problem with connecting to myspace and to try again later. This is cool application. Any other apps or generator you can provide to me for promotion purposes? It would work in all OS, right? Because the other one I used, it became useless after 3 months due to the Linux update and saying it's not anymore compatible with it. Thanks. The Myspace player embed does not work anymore. when is the autoplay option gonna be available and where are the buy buttons on this new version? Hi, the generator is a great idea, but anyway it doesnt work for mine either, apparently in May this year the player was upgraded and introduced to 25% of my space users. So lucky us, we have that upgraded new and improved player that so far seems impossible to embed to our website. 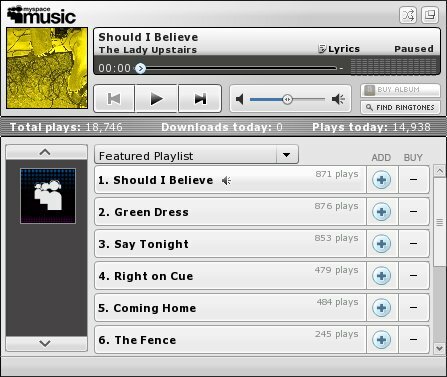 It does NOT work with the newest Myspace player (July 2011), because the new profile player there is a series of individual pop ups for songs, and not embedded on the page as it was before. We used your generator a few months ago to put a copy of our Myspace player on our profile at myboomerplace.com, and it worked fine (but visually, it didn't have the dark shading that it had on Myspace). Hello, is there a way to shut off auto play?? Send me an email about AUTOPLAY and I will fix this for you. The thumbnail is always blank for some reason. hey man when im posting the band player on other profiles in comments it dosent work... is it a fault ? Thanks for the code. I'm building my first website and am amazed how much free help there is online. I can get the new player to work in Chrome & Firefox browser, but IE shows s blank box. Is there a fix for that? Any update on the blank screen in IE? How do I use this with the Rugged theme? I tried entering the PLID etc. but it didn't show up. Thank you for letting me know, updated. Hi I like this how can i get in myspace. Page. Or can i haved in facebook 2? As soon as i put the code in my html page, it does not work any more. It works only her in this page where the code is generated. Been looking through the thread here to see how to have the player AUTO START. But have not seen any results on how to do such. Does anyone know? I don't see anywhere in the code to change such. It is an added command?